Tell me Bashir Sahab about your childhood, education and influences which brought you to Kashmiri literature? I was born on 15 April 1954, in village Hakura Badesgam in Tehsil Dooru of Annatnag District. I studied in the local middle school upto 8th standard, did matriculation from high school Dialgam and graduation from Govt. College Anantnag. I did my M.A. in Urdu from Kashmir University and also diploma from the same. Since I was in 8th class I started writing poetry. I joined films division Mumbai in 1982 as commentary speaker Kashmiri and worked till 1982 when I joined Indian Information service. 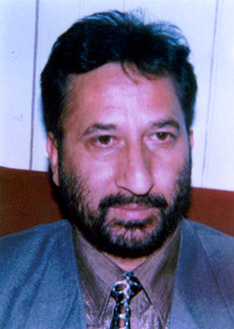 I am presently working as senior correspondent in Radio Kashmir Srinagar prior to that I worked as News Editor in Doordarshan Srinagar. When the militancy erupted in 1989 in Kashmir I was that time working in Radio as Assistant News Editor and also as correspondent. I have always stood against the militancy and reported bravely against it, since then. In 1993 I was instrumental in starting Radio News from Srinagar as it was shifted to New Delhi in 1990 under the militant threat. Consequently I became a target of militants. I was kidnapped in 1993 and had a miraculous escape when I jumped out of a three storied house in Rajbagh and rain away from militants. I have been constantly under security since then. My house at Shivpora was attacked twice with grenades and militants fired indiscriminately however we escaped. My children are studying in Delhi. I have so far four books to my credit, which include my poetry collection "Kani Shahar" meaning a city of stones in Kashmiri and "Maru-Vas" in Hindi again my poetry translated in that language. Besides I have two other books which are compilations in Urdu and Kashmiri. I know English, Hindi, Urdu and Kashmir languages besides a bit of Persian. I am a committed Nationalist and know the in and out of the ongoing proxy war in the state. I have participated in the National Symposium of Poets at Delhi and have got several awards including best media personality by Shaheedy Society. Did the politics in Jammu and Kashmir since early 1970 - 1980, shape the literary and cultural movement at that time? Did it influence you too? Definitely this was the most peaceful time in the History of modern Kashmir. The literary field saw many a leaps advancement as the writers, poets and other intellectuals were coming from different parts of the world. This is the period when I actively started not only writing but participating in symposiums etc. This period provided me the opportunity to publish my poems and short stories in different magazines of the state and the country. The period between 1970 - 1980 saw a tremendous spread of theater moment in the state in which I too was involved in the capacity of playwright and actor. The politics of the state though not directly but indirectly influenced the literature as this was the most peaceful and developmental period. Who are the major poets writing in Kashmiri and Urdu Today? The major poets are Prof. Rehman Rahi, Amin Kamil, Farooq Nazki, (Rafiq Raaz, Hamdi Kashmiri both in Urdu and Kashmiri), Gh. Nabi Firaq, Ranjoor Tilgami and my self Bashir Athar. Is there any underground Poetry Movement like the ones in the former Soviet Union? As such there is no underground moment but what ever has been written during the turmoil is underground as no body could dare to publish it except Farooq Nazki (Naar Hetun Kazal Wanas) “meaning the Kazalone forest is burning” a Kashmiri collection and “(Kani Shahar) “meaning a city of stones” again a Kashmiri poetry collection by myself which was published in 1996. Which are the key literary figures that influenced you in developing your poetry? Urdu poet Mirza Galib, Mir Taki Mir and Faiz Ahmad Faiz and in Kashmiri revolutionary poet Abdul Ahad Azad and Asad Mir. Bashir Sahab, your poetry reflects the hopelessness of the present situation and the desire to return to a place and time when Kashmir was a Kohinoor, art and culture thrived. Do you think some day Kashmir would find its rightful place in pinnacle and glory? Yes of course the disappointment itself gives birth to the desires and desires to the fulfillment of ultimate goal. I am not pessimistic but optimistic that my Kashmir will again be born and its originality with abundance of peace and tranquility will return. I am sure our culture and our traditions called Kashmiriyat are not so weak to be bulldozed by fundamentalism and violence. They will bear the onslaught of the time and will regain its glory and will become epicenter of peace and brotherhood. Kalhana the author of 'Rajatarangini' -history of the Kashmir Kings -the famous sanskrit poet of his time lived in a time of political turmoil in Kashmir, at that time a brilliant center of civilization in a sea of barbarism. Later the peace descended on the valley with a sort of cultural renaissance.It is certain that the valley will regain its glory as the epicenter of civilization peace and brotherhood.